Five full-page miniatures have been inserted as single leaves into this 13th-century Psalter, but they are in a different, older style, and are probably re-used from a 12th-century manuscript. There is no trace of a calendar or litany, and lacking any liturgical evidence, the manuscript has been tentatively attributed to the East Midlands. 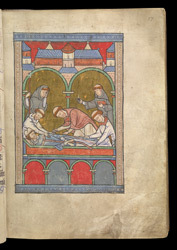 This is perhaps the earliest surviving image of the burial of Thomas Becket, which took place soon after his death in 1170. The upper right monk is holding a white object in his hand, probably a fragment of the saint's skull, which had been shattered when he was murdered. Becket is not depicted with a halo, which may suggest that this image was painted before his canonisation in 1173.